A new, completely natural CBD oil from Cibdol, available at the Dutch-Headshop. Cibdol is known for its pure and high-quality CBD oils. The Swiss company has proven this again, with this product. Because this 100% natural CBD oil is obtained from CO2 extraction and therefore free of chemical substances. The oil comes in a handy pipette bottle with 2.5% CBD. Available in three different bottle sizes of 10 ml, 30 ml and 50 ml. Easy to order at the Dutch-Headshop! 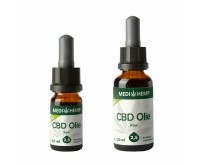 A completely natural CBD oil from Cibdol, available in three bottle sizes. Order your product simply at the Dutch-Headshop, and enjoy the excellent effects of CBD. Cibdol is known for the high-quality CBD oils it produces. This product is another excellent example. The oil is made of 100% natural grown industrial hemp and you will consequently notice the optimal beneficial effects of CBD. The CBD oil is free of chemical substances, thanks to the cold CO2 extraction through which the CBD is obtained. So, no solvents, flavorings and preservatives are added. Cibdol CBD oil is therefore a pure natural product. Cibdol CBD oil has several beneficial properties one should not underestimate. These benefits are shown below. The recommended dose is 3 to 4 drops a day. Drip the CBD oil below your tongue, keep it there for 60 seconds and then swallow it. Then, enjoy the excellent effects of CBD. Cibdol 2.5% CBD oil is available in three sizes. With regular or extensive use, it may be practical to go for the 50 ml bottle. Besides the larger quantity, it is also relatively cheaper. Cibdol is a Swiss company that produces CBD oil for years now. Apart from capsules, this company also produces high quality CBD oil. This oil is processed in capsules, and is among the very best of the world. Cibdol uses no chemicals during production, so all oils are completely natural. Furthermore, CBD oils from Cibdol are extensively tested in the lab. Order Cibdol CBD Oil 2.5% easily and discreetly at the Dutch-Headshop!